Engineers working on Britain’s new high speed railway have discovered an ancient, sub-tropical coastline dating back 56 million years. The layer of black clay is thought to have been formed from densely wooded marshes on the edge of a sub-tropical sea. The rare discovery was made at a site in Ruislip, West London, when HS2’s ground investigation team unearthed a previously unknown material, located up to 33 metres below the surface. The layer of black clay, which HS2 Ltd has named the ‘Ruislip Bed,’ is thought to have been formed from densely wooded marshes on the edge of a sub-tropical sea. HS2 Ltd made the surprising find while investigating ground conditions in the area, prior to the construction of the Northolt Tunnel, a 14 kilometre tunnel which will run from West Ruislip to Old Oak Common. HS2 has been investigating the ground at around 8,000 locations along the first phase of HS2, from London to the West Midlands. 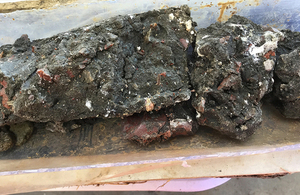 Although ground investigations regularly take place across the country, it’s really exciting and very unusual to come across a material that no-one has ever seen before. The ‘Ruislip Bed’ discovery is particularly fascinating, as it is a window into our geological history. It would have been formed during the Paleocene period, which was a time of intense change, with new animals evolving following the extinction of the dinosaurs. Most of Southern England was covered by a warm sea and this clay helps us to pinpoint where the coastline was. Since 2015, we have been investigating ground conditions along the route of HS2, so we can design the railway in the safest and most efficient way. We have been exploring the soil and rocks beneath the surface through various methods, ranging from drilling into the ground and taking samples to using radar technology. Our main investigations are almost complete, with over 1 million laboratory tests undertaken on the samples we have taken. It’s the largest ground investigation programme that the UK has ever seen and an unparalleled opportunity to learn about the ground beneath our feet. The initial ground investigation programme on Phase One of the railway, from London to the West Midlands, will be largely complete by the end of March 2018. This will be followed by supplementary, targeted investigations, led by HS2’s main works contractors.